N.T. 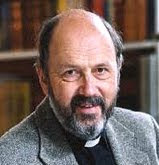 "Tom" Wright, Bishop of Durham from 2003 to 2010, and now Research Professor of New Testament and Early Christianity at the University of St Andrews in Scotland is widely respected ecumenically for his scholarship and in particular his historical apologetics. He was the Anglican observer and an invited speaker at the Roman Catholic Synod of Bishops in 2008 on "the Word of God." His home page is HERE. Some of Bishop Wright's views are controversial (especially his "new perspective" on St Paul and the doctrine of justification); but he is widely acclaimed for his presentation of the basics about Jesus in the face of a sceptical world.